In the Bible, we see more than one occasion where false Gods are proven to be powerless. Elijah, on Mount Caramel, proved to the people that Baal had no power, (1 Kings 18). The people called out to their god, with a loud voice. They were determined that their god would answer them, so much so, that they cut themselves and performed rituals associated with worshiping their god. Baal did not answer them, instead, the God of Israel answered Elijah's prayer by fire. "When all the people saw it, they fell on their faces; and they said, "The LORD, He is God; the LORD, He is God," (1 Kings 18:39). When I think of the Ark of the Covenant, I think of the presence of God. In the Old Testament, this was his dwelling place. While the Israelites wandered in the wilderness, they would carry the Ark and when they would stop and set up camp it was placed in the Holy of Holies in the tabernacle. This is where the priests would meet with God. When the Philistine god was confronted with the presence of God, it could not stand. Fast forward to the New Testament. Hebrews says that Jesus does not dwell in holy places made with hands, as the Ark and tabernacle were, but now in heaven itself, to appear in the presence of God for us, (Hebrews 9:24). Those of us who have received the blood of Jesus for, the remission of our sins, are God's dwelling place. (Ephesians 2:22). He no longer inhabits a place but a people. You can travel to the best churches, conferences or even Israel itself but it doesn't matter where you are, God can and will meet you anywhere, (Psalm 139:8). If we as Christians, carry the presence of God, then we need to realize the power in us. There truly is power that will shut up the mouths of the false gods that surround us everyday. I mentioned how, in the Elijah account, the people shouted using loud voices yet to no avail. Their god did not hear nor answer. We hear loud voices shouting out to the gods of this day all the time. The loud secular music blasting in the car next to us at the intersection, for example. The poor soul listening to it is simply crying out in desperation hoping that this music, that they can relate to, will help them in their time of need. It won't. The gods that the world are trusting in are seemingly endless as are the ones infiltrating the church. I don't think I need to list them here as they are quite obvious. I'm sure that like me, you see certain gods elevated higher in this world than the Lord Jesus and it tears you up. DON'T ACT RASHLY: When Moses came down from Mount Sinai, he was prepared to share with the Israelities the commandments that God himself had written on tablets of stone. 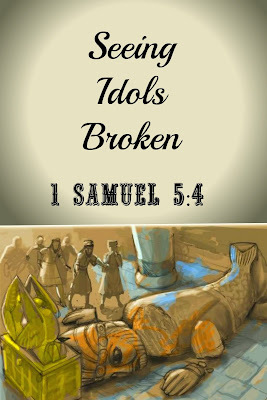 When he came down, he was disappointed to find that the people were not worshiping the Lord, but a golden calf. Moses was angry and threw the tablets of stone down so that they broke. He then had to go up and and receive the commandments again, on new stones. When you see others serving false gods, even those who once followed the Lord wholeheartedly, don't act rashly. Yes, what they are doing is wrong but don't get so mad that you yourself break the commandments of God. Sometimes we can get so frustrated that we find ourselves sinning because of our anger. Then, like Moses, we will need to go back up the mountain and spend time going over the basic commandments of God, again. "Be ye angry and sin not," (Ephesians 4:26). PRAY: Be like Elijah and pray. Pray and trust that God will show himself powerful. Yet don't sell yourself short. God may use you, as he did Elijah. Elijah was a vessel. He was the one that poured water on the alter and he was the one that called out to God to make himself real in front of the people. Pray for opportunities such as these in our society where you can cast down the lies of the enemies and be a vessel where others can see the power of God. BELIEVE GOD WILL DO IT: In the days of Dagon, I'm sure it seemed impossible for this idol to be destroyed, yet when confronted with the Ark of the Covenant, it could not stand by it's own power, anymore. False gods only have as much power as people give it. When God comes on the scene, they become rendered useless. Stay in the Word of God and obey his word. Stay humble and of a contrite spirit. Pray without ceasing and be confident in God. Be steadfast and unmovable and you will see the gods of this world break before you as Dagon did. They cannot stand forever. They will fail and they will fall.